This sensational contemporary beach front estate will be an exceptional luxury villa – an architectural masterpiece and different from all other villas for rent in the Dominican Republic. From its elevated position next to the waterfront, the newly built 6+1-bedroom luxury villa enjoys stunning views of the Ocean from almost every room. The fabulous gourmet kitchen with sliding glass doors opening out to the pool and the courtyard is a design conscious food-lover’s dream. Both the dining room and living room are facing the sea and offer panoramic views through floor to ceiling glass doors and the calming sound of the waves gently crashing on the shore. The living area opens out to a spacious patio and a private staircase leads from the patio directly to the white sand beach and calm blue waters of the Cabarete Sea. This luxurious modern villa in Cabarete is very exclusive and very special and has been created with a privileged lifestyle in mind. The newly built modern home, which enjoys great sea views, encompasses 6 en-suite bedrooms, a living room a large modern kitchen, large terraces, outdoor pool, chill out area. The modern, architect designed Cabarete villa sits on a plot of 2,600m² and the area benefits from onside security guard for additional safety. 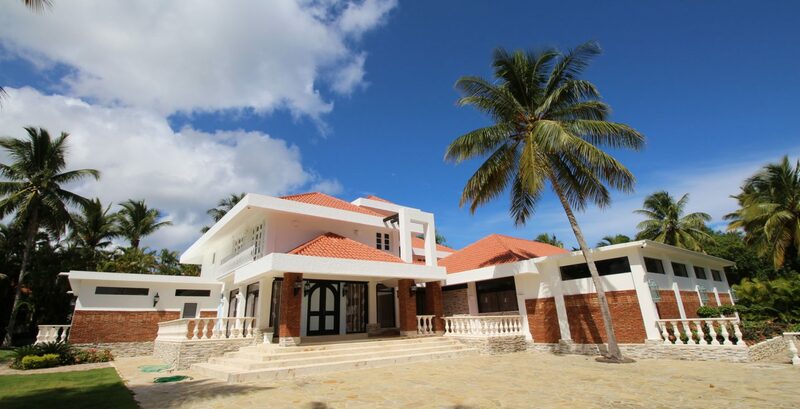 This modern beach front villa for rent in Dominican Republic is a superb example of a luxury Caribbean beach front property.